As the business landscape continually responds to economic stimuli and technological advances, a manager’s role must shift simultaneously. No longer operating on a static, predictable playing field, managers must hone an ever-evolving set of skills while preparing to adapt at a moment’s notice. As a result, a select number of careers have emerged as the top management opportunities for motivated professionals. Managers have long been accustomed to confronting sizable challenges, both during a normal workday and over the course of their careers. In 2018 and beyond, however, managers have begun to face a new test of their skills and experience. As Joseph Pistrui and Dimo Dimov write for Harvard Business Review, few of today’s managers work toward stable targets. Instead, many operate in constantly changing environments, and they must adjust their strategies accordingly. As a result, today’s managers must develop new models of the future, which allow them to engage more effectively with their teams and work toward their objectives more efficiently. Outdated approaches and obsolete training have the potential to compromise many managers’ capabilities. However, adopting innovative management methods and completing advanced academic programs such as a Master of Science in Management degree may enable motivated professionals to pursue some of today’s most prominent management careers. Adept at keeping plans on budget and on schedule, project managers are essential in a range of industries, from technology to manufacturing. Project management professionals master the dual abilities of overseeing projects from a high level and addressing minor challenges as they arise. These are some of the capabilities that make project managers particularly valuable. They can assist industries that regularly confront complex developments and those that anticipate substantial change. The U.S. Bureau of Labor Statistics (BLS) expects 11 percent growth for project managers from 2016 to 2026, a figure that suggests faster than average growth for this job market. Project managers who learn how to facilitate effective strategies and master technical tools, such as Gantt and Project Evaluation and Review Technique (PERT), may have the best chance of advancing in this field in 2019. Professionals who pursue a Master of Science in Management degree have the option to specialize in project management to acquire high-level skills designed to help them excel in this role. Individuals may also pursue the Project Management Institute (PMI) certification to advance their professional skills and experience further. The U.S. economy continues to recover following the Great Recession, driving an additional need for managers. However, this recovery is not preventing companies in almost every industry from striving to keep costs as low as possible while maximizing profits. Product owners typically accept this challenging role, which requires them to optimize the value their firm can gain from developing and releasing a product for sale. Similar to project managers, product owners handle cost estimations, development schedules, and personnel. Unlike project managers, product owners work almost exclusively with software and technology, as this role originated within Scrum, the agile software development framework. Product owners can benefit from a graduate-level foundation in management and leadership. Due to their focus on computing technology, product owners also have the potential to capitalize on some of the most in-demand and lucrative skills of 2018. As Larry Kim writes for Inc., mastering skills such as cloud and distributed computing, web architecture and development framework, user interface design, and mobile development could make product owners some of the top management professionals in 2019. Whether partnership managers serve as a firm’s managing partners or as corporate executives, these professionals take responsibility for overseeing key business operations. From personnel and customer relationships to projects and product development, these leaders handle a range of high-level matters for a partnership. While partnership managers have one of the most in-demand jobs for 2018 and beyond, according to Money, these professionals may find it useful to take a forward-thinking approach to management. In addition to earning a graduate degree in management, making a sustained commitment to learning could continue to benefit aspiring partnership managers. As Pistrui and Dimov suggest, embracing dynamic learning, rather than static knowledge, is likely to propel organizations forward in 2019 as well as in the future. Similar to partnership managers, operations managers handle both day-to-day business administration and long-term strategy. From developing corporate policies and handling human resources to overseeing materials and supervising projects, these skilled professionals manage diverse operational matters. While operations managers may have been able to follow traditional corporate roadmaps in years past, in 2019, these leaders must strive to innovate rather than repeat. Aspiring operations managers can learn how to continually encourage inclusivity and embrace novel ways of thinking at all stages, not just during growth phases only. While management roles in the technology and engineering industries have shown the most promise over the past few years, leadership positions in construction and real estate have demonstrated the greatest growth potential in 2018 and beyond. As Julia Glum explains in Money, demand for managers in the latter industries has accelerated in recent months. The BLS projects 10 percent growth for the real estate manager job market over the course of the next decade. To excel in this role, aspiring specialists in this field should consider focusing on an area such as retirement centers or health care facilities, places where a growing older adult population is likely to generate continued demand. Professionals who pursue a Master of Science in Management degree program have the option to specialize in real estate management. They can learn the latest developments in the business of real estate, investment issues, relevant regulations, and global markets. As organizations strive to scale quickly and stay ahead of their competition in 2019, management consultants are tasked with improving efficiency, establishing effective processes, and increasing revenues. Many specialists in this field also take responsibility for managing organizational change and helping businesses succeed as they pivot strategically. The BLS projects 14 percent growth for this field over the next decade, growth which makes the management consultant role one of the fastest growing career paths for management experts. Those who complete a graduate degree in management and opt to focus on health care, information technology, or human resources may have the greatest job prospects and potential for growth. Similar to management consultants, agile coaches typically work for organizations that aspire to undertake significant changes and pioneer strategic positioning. Unlike management consultants, however, agile coaches specialize as experts on the agile method. They help team members at all levels implement this renowned project management strategy that allows for continual, rapid change. Considered one of the top management career paths for 2018 by Money, agile coaches may find numerous opportunities to put their experience to work in 2019. To optimize their career potential, aspiring agile coaches should consider focusing their graduate degree program on project management and developing in-demand skills such as business intelligence, visualization, and process management. To embrace new trends in management and to pursue this career path effectively, motivated professionals must think differently. From pursuing high-level training and achieving innovative mindsets to completing advanced degrees and acquiring forward-thinking skills, taking a fresh perspective on management could enable aspiring leaders to achieve success. No matter which career path they choose to pursue, management professionals should ensure that they have the right “soft skills” for the job. 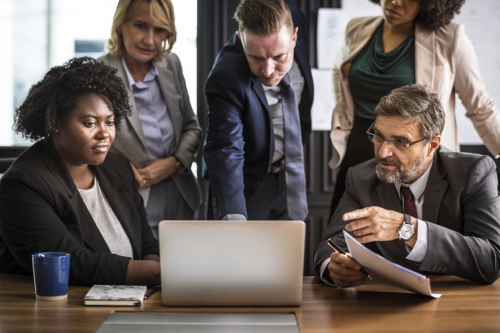 As Hannah Morgan writes for S. News & World Report, today’s management specialists must master leadership, collaboration, communication, and time management skills. Completing a single course or training session may help highly experienced managers pivot as necessary. For professionals working toward a career change or seeking a higher-level position, pursuing a graduate degree in management may produce the most effective results. From managerial roles to coach and consultant positions, management specialists may have the potential to choose from a range of quickly growing fields. With its advanced curriculum and completely online offerings, the Master of Science in Management degree program from New England College allows students to level up their skills, absorb the latest management trends, and gain real-world experience, all while continuing to work in the field. Contact the School of Graduate and Professional Studies at New England College to learn how a Master of Science in Management degree can prepare ambitious professionals for an in-demand career.